Description: Mid sized refractor aimed at new astronomers. Comes with 20mm and 4mm MA eyepieces as well as a computerized Alt-Az mount and a 3x Barlow lens. Also includes a 5x24mm finder and 1.5x erecting lens. I've been observing in earnest again for about a year, after a hiatus of 20 years. I'm slowly relearning the sky and can now find a handful of the Messier objects, but I am by no means an expert. Light pollution in my Oklahoma backyard puts most deep sky objects off limits, but I like to find star clusters, planets, brighter nebulae, and double stars. Observing from my yard usually involves moving to dodge trees and streetlights. I was looking for a small, easy-to-hoist scope (something lightweight to use when my back goes out! ), plus I wanted to dabble with computer control. 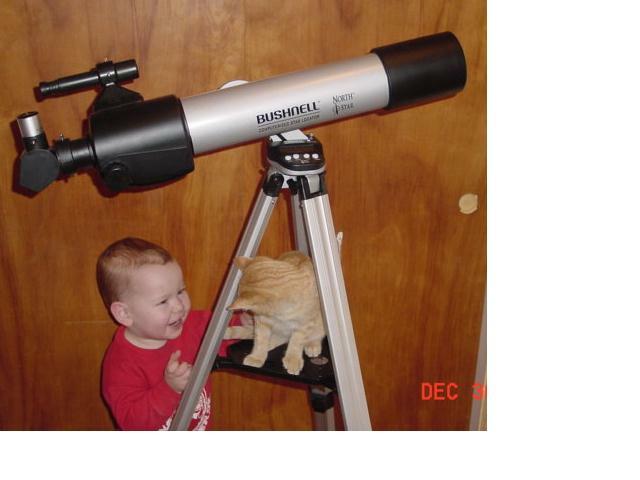 I decided on a refractor for its simplicity, looked at Meade and Celestron versions, but chose Bushnell's 80mm model. It offered the largest number of astronomical objects in the computer's database (20,000), had a longer focal length (720mm), and being an f/9 achromat it promised far less false color. To be fair to Meade and Celestron, I realize that most of the objects in the computer's database lie beyond the capabilities of an 80mm scope. Before ordering I looked at Bushnell's Northstar 60mm refractor and 3" reflector in a local WalMart. Both mounts looked solid with cast aluminum arms and the scopes appeared well designed and manufactured. I eventually ordered Bushnell's Northstar 80mm refractor for $220 from discountoptics.com, receiving it two weeks later drop-shipped directly from the main factory in Kansas City, Missouri. The design is idiot-proof: you attach the optical tube to the computerized mount with a couple of bolts. The computer takes a single 9 volt battery, easily installed from the top. In theory the main objective boasts a magnesium-fluoride coating, but the lens looks colorless to me. My objective had a couple of hairline scratches on the backside, but a look down the tube showed two nicely designed circular baffles. When Bushnell says "kinematic mount" they mean "unpowered." You move this scope by hand. After alignment and selection of an object in the database, you move the scope with your hand until the azimuth and altitude arrows on the display zero out. This design works well and lets you quickly move to any point in the sky. I found I preferred it to other computerized scopes that use geared motors for movement. I used to own one, but it seemed I spent more time watching the little thing laboriously slew from one star to the next than I actually spent looking through it. The Bushnell scope may not be able to track objects for you, but you won't spend all night waiting for it either. The Bushnell also remains useful if the battery goes dead--unlike my previous computerized scope. Instead of a conventional star diagonal, Bushnell supplies their "Penta-prism." Light entering the penta-prism from the telescope first hits a mirror that bounces it downward (away from the eyepiece), onto a lower mirror that bounces it back up into the eyepiece. I hoped that the second bounce might flip the image to make it right side up, but like most astronomical scopes the view remains upside down. This design adds extra distance to the light path, and I discovered that a conventional (90 degree) star diagonal works only if inserted about halfway into the scope. Bushnell uses plastic for many parts, including the penta-prism and focus tube. I wanted a very light telescope, and plastic makes that possible while staying tough, dimensionally stable with changes in temperature, and corrosion-free. But the light weight makes the penta-prism attachment to the scope a tad fragile. Be careful not to torque down the set screws too far and strip them out. The penta-prism offers a very shallow eyepiece receptacle, too shallow for some of my longer 1.25" eyepieces. (The actual opening at the base of the eyepiece receptacle measures around 1/2 an inch.) Perhaps Bushnell employs this design to discourage the use of heavier eyepieces which unbalance the scope. Since the scope relies on friction in the altitude gear for balance, forget using anything bigger than 20mm-25mm eyepieces unless you want to hang weights on the front of the tube. According to my highly accurate bathroom scale the scope plus tripod weighs 8 pounds. With the tripod collapsed and scope detached this makes one highly portable rig, easily carried in a backpack. I set up the scope on a cloudless, crystal-clear, 30-degree night. The moon and Jupiter dominated the eastern sky, Orion lay in the southeast, Saturn perched close to the zenith, and Mars sat high in the southwest. I set up the scope as directed, aligned the leveling marks scribed into the altitude bearing, then pointed the tube north using the supplied hand compass (a nice touch). I tried to work my way through the "Earth Align" option in the computer, but trees kept blocking most of my guide stars. As I tried stars at random, the computer informed me when a choice lay below the horizon. I soon learned that the computer's "Explore" option provides the quickest alignment. You select "Explore," then an object type (Constellation, Planets, etc. ), then a specific object. Back out to the Align Object menu, press Enter to see the name of the object you previously selected, then center the object in a low power eyepiece. When you press Enter again the computer politely says "Thank you" and displays up to five stars indicating the precision of your alignment. If you do this periodically throughout your viewing session your calibration gets better and better. I aligned the scope using Jupiter and Mars, widely separated in the sky, then told it to locate Saturn. I moved the scope till the altitude and azimuth indicators zeroed out and found Saturn waiting just outside the 20mm eyepiece's field of view. I did another "Align Object" on Saturn, then asked the scope to locate the Trapezium in the Orion Nebula. This time I when I zeroed out the indicators, the trapezium lay in the field of view. From there I selected "Deep Sky Objects" and selected the Pleiades. Zeroing out the indicators brought the Pleiades into view, almost centered. I found the software easy to use, but navigating through an extensive star catalog with only up and down cursor keys takes time. Copious (and illegible) descriptive text scrolled by after selecting objects. I tried every backlight setting and looked in vain for a way to slow down the scroll rate. Using a red flashlight improved legibility a bit. The computer offers several modes of operation, like "identify" and "Sky tour," but I eventually settled on "telescope" mode. This setting just displays a continuous readout of the scope's coordinates. Using this mode I freely panned and scanned at will, star-hopping till I got out of familiar territory (which is often for me), then I fired up Andreas Hofer's excellent Planetarium software in my Palm Pilot. The Palm Pilot showed me the usual suspects for the coordinates shown on the scope's computer. Navigating this way proved painless, fast, and didn't waste my time trying to scroll through endless lists of astronomical objects on the mount's tiny screen. The Bushnell computer remained perfectly capable of telling me this same information, but I'd forget that I set the object type to "constellation" when I asked the computer to identify a star, be told that I was looking at Cassiopeia, then have to back out, change the object type, and use identify again. So if the Bushnell Northstar scope makes navigation a breeze, but what about the optics? Using a Celestron 20mm Plossl eyepiece (magnification of 36x) the Orion nebula swam into view as a distinct, if dim cloud with stars resolved to fine, round discs. I switched to a 15mm eyepiece (48x), then to a 10mm (72x), then to an 8mm (90x), but the trapezium still showed only three stars clearly. With progressively higher powers the scope also became more difficult to focus. You pay for such a light mount with increased vibration, and I learned it takes a very light touch indeed to achieve crisp focus. Mars had moved behind a tree and I couldn't uproot the scope to chase it because I now had the computer aligned, so I opted for Jupiter and Saturn. Their images showed almost no false color (the nice thing about an f/9 scope) but again proved difficult to bring to focus. Saturn's Cassini division was tough to make out, but Jupiter clearly showed two maroon bands and four postcard-quality moons. Views from the 8mm eyepiece were pretty fuzzy and I'd say that the most useful magnification range for this scope is probably 40-90x. On a big target like the moon the 4mm eyepiece gave surprisingly detailed views at 180x, but the narrow field of view and the vibration of the scope made such high power futile on point objects like planets. Most of the the Pleiades fit into the field of view of a low power (36x) eyepiece. As I panned across, inspecting the crystal-like structure of blue stars, the scope delivered sharp, pinpoint images from one edge of the field to the other. The tripod and mount are exceptionally well designed. The scope remains always in balance and the computer system is easy to use, if a tad hard to read. (Maybe the display doesn't like cold weather?) The human-powered nature of the mount means that you will never be stuck out in the field with a computerized scope that won't move because the batteries are dead--something that happened to me once with a another computerized refractor. It may not seem like a bit deal, but I also like the fact that Bushnell included a nice hand compass in the box with the telescope. By the way, this refractor performs quite well in the daytime. I used the scope to follow a red-headed woodpecker at 72x, 100' distant, working his way up the bark of a dead pecan tree. The image snapped into crisp focus with vibrant color and I clearly saw termites scurry from under bits of bark to evade their methodical predator. To bring the erecting lens to focus I had to insert it in the top of the penta-prism, and I soon opted to just use the penta-prism alone (the image is brighter), compensating for the inverted image by standing with my back toward the front of the scope as I looked in the eyepiece. The plastic mount for the finder scope has three alignment screws, but the body of the finder is too narrow for the screws to grip it tightly. For the screws to have any bite you have to mount the finder up close to its objective. This leaves the finder's eyepiece sticking far enough out the back of the mount that you can easily bump it with your head as you look through the main eyepiece. I bumped the finder and misaligned it so often that I gave up using it. I'd recommend replacing it with one of those red dot, non-magnifying finders. The supplied eyepieces are serviceable, but the scope responds well to better quality eyepieces and you should plan to acquire a few (I would up using 20mm and 10mm Plossls the most). The scope could also use tension and/or locking mechanisms for both axes, since it is easy to move the telescope off target when pulling out a low power eyepiece to insert a higher power. The tight fit in the shallow eyepiece receptacle often pulls a slight vacuum when you extract an eyepiece, adding to the problem. Forget zoom eyepieces and those in the 25mm or larger range--the scope won't balance. This is a shame, because the scope gave wonderful, wide-field views with my 40mm eyepiece (though I had to prop up the tube with my hand). I considered returning this scope, but it kind of grew on me. Bushnell is so close to greatness here--all they need to do to fix this scope is use a better coating on the objective lens and blacken the edge, deepen the eyepiece receptacle of the penta-prism (or just use a normal star diagonal), provide some decent eyepieces, and ditch the finder scope for a red-dot (non-magnifying) type. The tube could also use some kind of balancing mechanism, as simple as a clamp sleeve for the telescope tube that lets you slide it forward for heavier eyepieces (the current mount simply bolts on to the side of the tube). Adding friction-control thumb screws to both azimuth and altitude bearings would help keep the scope properly pointed while changing eyepieces. The mount's computer has a phone-jack connector on the side which the manual simply identifies as "computer link." I'm sure that with the appropriate cable I could probably connect the mount to a PC or even to my Palm Pilot, but the manual doesn't shed light on the procedure. If I were calling the shots at Bushnell I'd patch the software in the computer to permit slowing down the scroll rate. I'd also one-up Meade and Celestron by formally offering a Palm Pilot connection kit for Northstar scopes. Palm Pilots are now as cheap as Meade's $100 Autostar hand controller and far more useful. Coupled with Planetarium software (a whopping $24 from http://www.aho.ch/pilotplanets/) a Palm Pilot is enormously easier to use than a hand controller. Astronomy is a visual pursuit--it is amazing how helpful even a small Palm Pilot-size screen can be to navigate and learn the stars. There is a big gap between telescopes controlled by hand controllers with dinky two-line displays and telescopes controlled by expensive laptop computers. A Palm Pilot neatly fills that gap. Many folks spend more than the cost of this Bushnell to buy wide field, short tube refractors. For their money they receive short focal length (typically less than 500mm) achromatic refractors that show lurid false colors on bright objects and offer limited magnification potential. Bushnell, on the other hand, delivers a nice mount, a computer, and a relatively color-free image in exchange for some vibration and a slightly reduced field of view. I'd like better optics, but I'm delighted with what Bushnell packed into this $200 telescope. I'm less worried about magnification limits because most of my viewing occurs below 125x. For purely visual observers using unpowered mounts, higher magnifications require too much nudging of the scope to keep objects in view anyway. I salute those of you in quest of rock-solid mounts and apochromatic optics. I hope to join your ranks someday. But don't lose sight of the fact that the thrill of learning compensates for less than perfect equipment. Learning only takes place when equipment is affordable, light enough to be carried out into the yard, and regularly used. Thirty years ago I was delighted beyond measure when the atrocious optics of a department store 60mm refractor gave me my first view of Saturn. Now I want a lightweight companion scope, more powerful than binoculars, to help me relearn the sky. I can't think of a better cost versus benefit solution than what Bushnell provides with their 80mm Northstar refractor. I've got an older Celestron C90 (a rubber-armored 90mm Maksutov scope) that I've never been able to satisfactorily mount for star gazing. It's a bit heavy for photo tripod heads and because I also use it as a spotting scope I never wanted an equatorial mount. As an experiment I removed the top of an Orion Paragon tripod head, screwed it into a short piece of wood with holes drilled to line up with Bushnell's mounting bolts, then attached the C90. The mount handily balances the Celestron in any orientation, doubling its usefulness to me (see photo). I'd priced more primitive alt/az mounts for the C90 scope before, but Bushnell gave me a tripod, computerized mount, plus an 80mm refractor for less money!